UNA SERA OFFERS A BESPOKE MADE TO ORDER SERVICE, ENTIRELY TAILORED TO YOUR NEEDS AND DESIRES. THIS IS WHY IT IS UNIQUE! We all have our preferences. 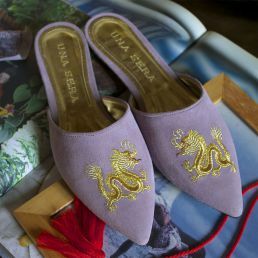 At UNA SERA we offer you an infinite variety of materials (leather, suede, fabrics…) and colors both for the upper of the shoe and the insole. UNA SERA is the sum of its details, that’s why packaging’s colors and layout reflect the stylish touch of the brand. The pattern of the box has taken inspiration from a charming early 900 carnet du bal and expresses the Boudoir state of mind. The more UNA SERA boxes you have the more your closet will be adorable…! Please allow a delivery estimate of 8 weeks. © 2019 Una Sera di Gennari Santori Paola. All rights reserved. VAT no. 02597930417.